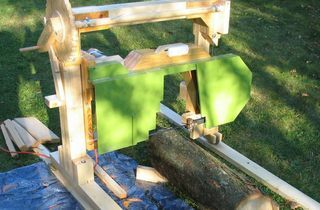 I found your work on woodgears.ca in 2011 and have been following your projects since. With three young kids, job, house restoration and everything, I don’t have too much time to do such things myself. But when there is an opportunity to do some woodworking the way you do, I use it. 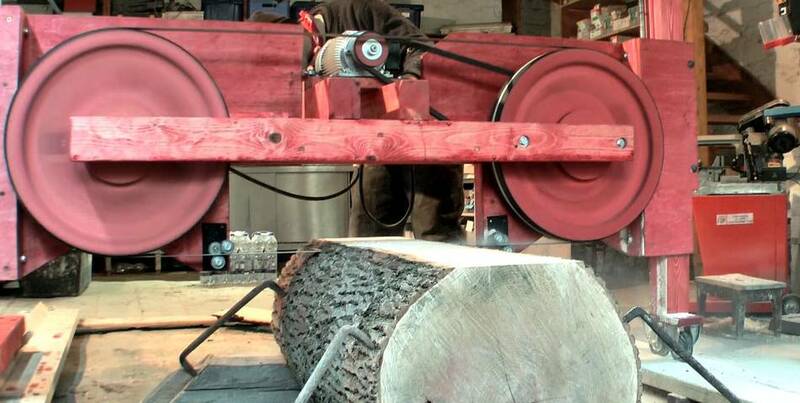 When I got some logs for free and needed a band mill, that was such an opportunity. 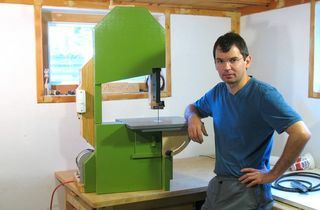 Building a band mill instead of buying one seemed to make more economic sense than building any other woodworking machine. I went through all of your articles and videos about bandsaws. Then I came up with my own design. In the end there weren’t many parts that are exactly like your parts. The part most similar to yours is the wheels, I think. But as I have tried to absorb everything that I could from your ideas, this machine is in some ways a derivative of a Matthias-Wandel-machine. Especially non-complicated design and the use of wood as much as possible is a trait, I think. But I also noticed that you are not averse to using metal parts where they give the machine a better performance. I had to make some crucial parts with metal, too. Maybe there are people out there who would try to make even the ball bearings out of wood, but not me. 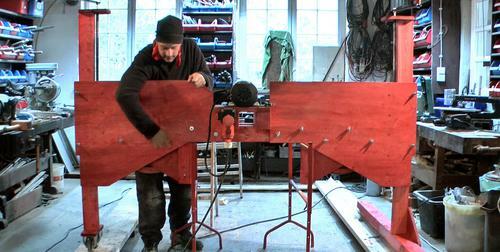 In a complementary way there are people who have built sawmills with extremely heavy and bulky steel frames. I tried to use both materials each in the parts where they do best. 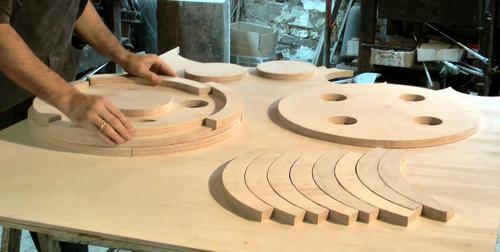 The construction is different to an upright table bandsaw. 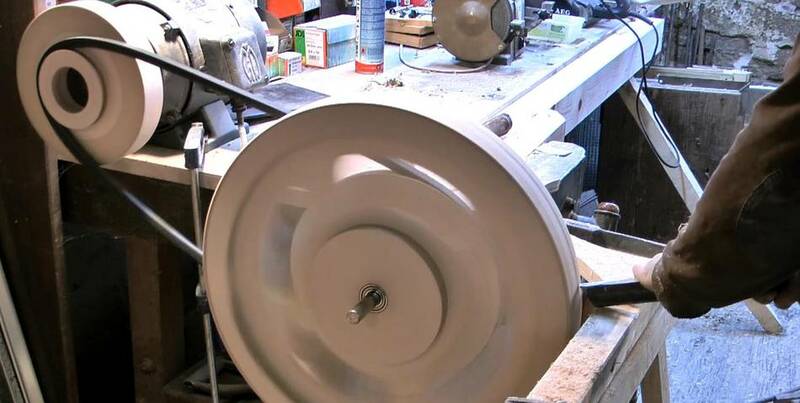 The frame connects the two wheels directly, because a band mill doesn't have to cut very deep. 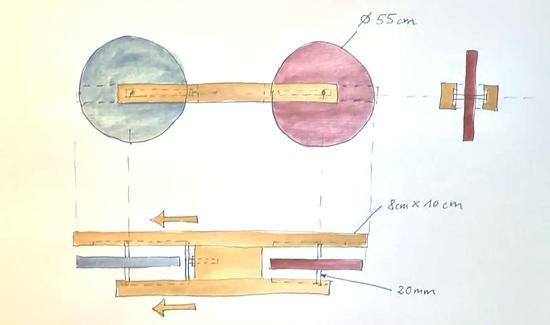 If I mill large beams, I would saw from four sides; if I make boards, they won't be thicker than 20cm. 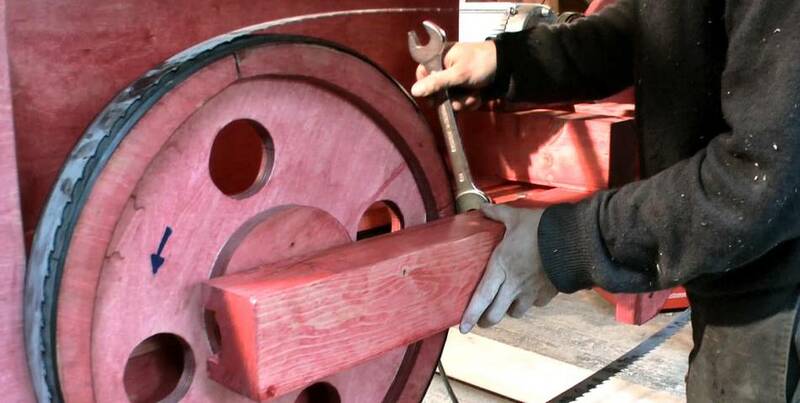 So the frame is straight and also supports the wheels on both sides. I thought that would be good for stability and would make the tensioning of the blade easier. That turned out to be right; I am very pleased with the mechanism that holds the non-driven wheel and presses it outwards by turning a nut. 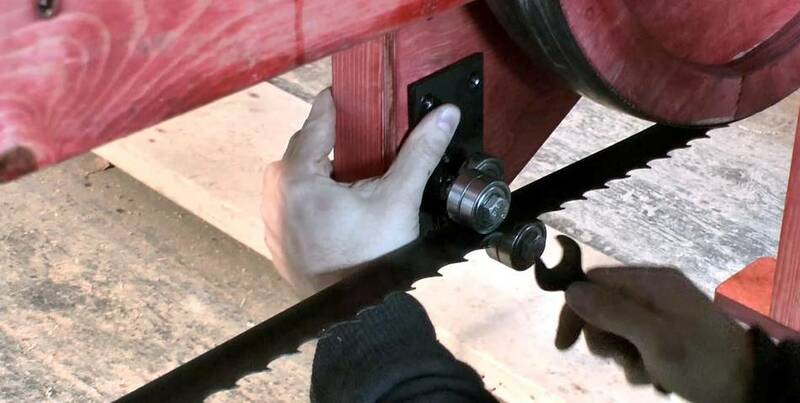 All force goes to the middle of the frame, so the alignment of the wheel doesn't change with the blade tension. 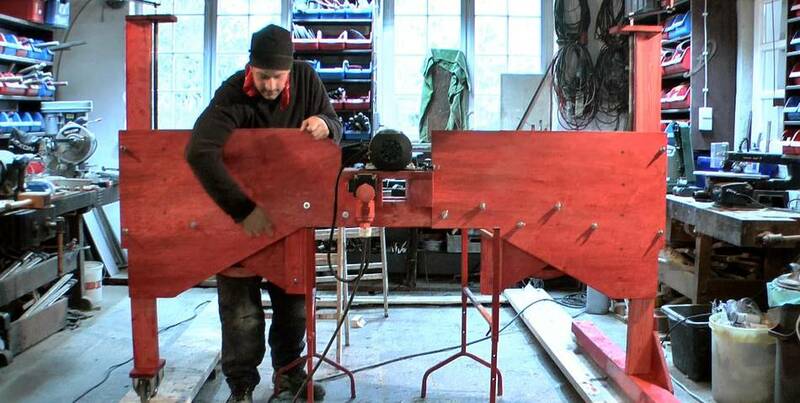 The wheels are made of 21mm plywood almost exactly the way you made yours. 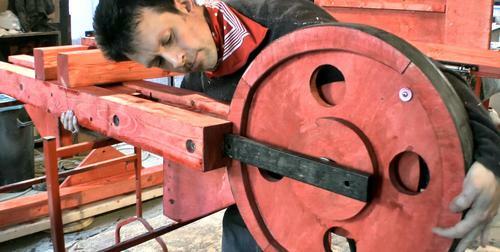 They do very well and run reasonably true after turning them round and balancing them. The only problem is that I think I wasn't able to press-fit the ball bearings tight enough into the wheels for the enormous blade tension I have to put on the wheels. Maybe they will wear out after some time. 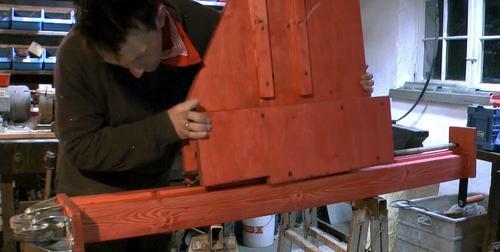 The posts to hold the frame are nothing special: threaded rods run the main frame up and down and are driven by handles on the top. No mechanism for lifting the saw on both sides simultaneously. That means more work, but gives me some nice possibilities (making the blade level or setting it at an angle). 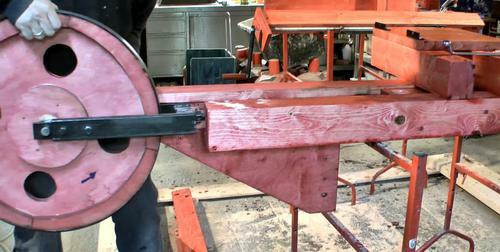 For moving the saw I chose your way with one post rolling on a saddled profile and the other on an even surface. The saw is driven by an electric motor. I tried to use a 4hp combustion engine first, but that turned out to be difficult. with 3.8 kW and 2800 rpm. That means 800rpm for the wheels and 24m/s (4800 feet per minute) for the blade. The blade itself is a Logosol LM Pro blade with 4246mm length. I thought that it would be better to use a sawmill blade than a regular upright bandsaw blade. I had some problems with the blade guides: after two failed attempts, I made guides with five ball bearings each. They can be adjusted by tilting them, but they still aren't working perfect. Cutting with the saw is nice and easy, but loud. 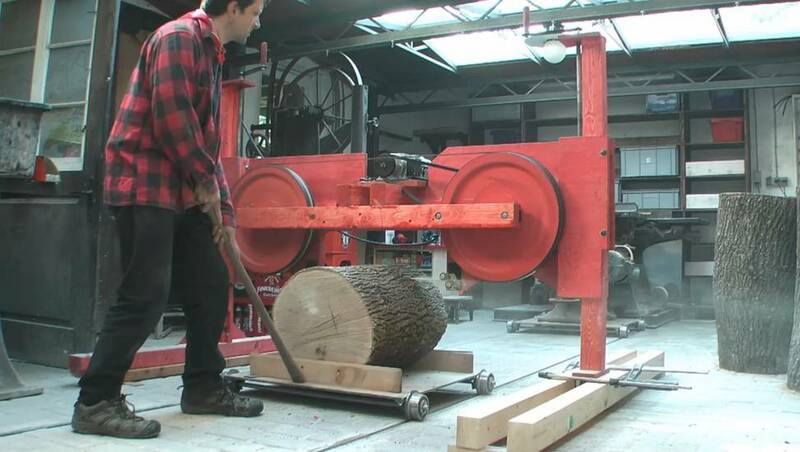 I used the method of moving the saw first and then tried moving the log on a platform on tracks in my shop. After all that work I'm pleased with my saw, but as it often is with such projects: It was more work that I had anticipated. I would never have made it without knowing from you that such things really can be built. I don't know what is next. I will have plenty of work on my timber framed house. But when I stood by my band mill and looked at the enormous piles of sawdust, I thought: "Hmm, maybe I should make a dust collector, too"
Matthias Burger has more interesting videos on his YouTube channel.